Claim up to $/€500 welcoming bonus Play Now! July 2015 was a sizzling summer for Microgaming casinos on the back of the release of the Hot as Hades slot. Thematically, it’s a slot based on Greek mythology, with Hades being god of the dead and king of the underworld. Fortunately, Hot as Hades is much lighter in tone, having been designed with cartoon graphics. 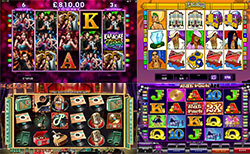 As explained, Microgaming developed Hot as Hades with cartoon visuals, thus making the slot easy to process whether on mobile or desktop at Microgaming casinos online. This is a positive because the slot isn’t as data-intensive as some of the most advanced video slots. Microgaming has kept the structure simple and effective, with the Hot as Hades slot utilising five reels by three rows. For each spin, players will have the chance of winning by matching three or more symbols from left to right over 20 fixed paylines. Having 20 paylines makes the slot really affordable to play. Basically, players will have all possibilities covered and can wager from only €0.20. Going up the scale, the maximum possible wager on a spin can be a weighty €50.00. The wild logo and skull scatter symbols are far and away the most valuable and can pay out a 2,000x multiplier when five of the same are matched on a single payline. Hades is also quite valuable and can be worth 1,000x to players. The logo wild symbols are quite standard in that they fill in for missing symbols except for scatters. Meanwhile, free spins can be randomly triggered following any spin. • Pillars of Awesomeness: choose a pot to secure a random bonus or win all. • Medusa’s Gaze: select one of the paths to try and receive a bonus win. • Poseidon’s Ocean: pick a shell and the outcome could be two bonuses, two blocks, or win all. • Zeus’ Stairway: the clouds can provide two block symbols, two wins, or else win everything. • Last Level: discard your first choice and pick again when you don’t win. Hot as Hades should be played due to the sheer number of chances to win. The wilds, scatters, and Hades symbols are all extremely valuable, but players can also win big from the bonus game and free spins.